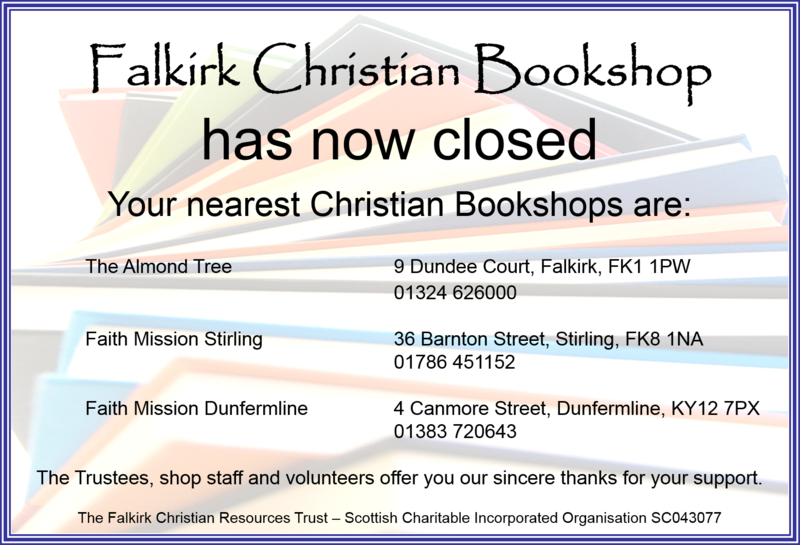 It is with considerable sadness that The Falkirk Christian Resources Trust has announced the closure of Falkirk Christian Bookshop. From its opening in February 2010, Falkirk Christian Bookshop has served the local churches and wider community as a source of Christian literature, cards, gifts and multimedia, firstly as an independent bookshop and, since 2012, under the ownership of The Falkirk Christian Resources Trust (SCIO). Many people have benefited from our ministry over this time as we have been able to publicise Christian events and initiatives in Falkirk and its surrounding area, and to resource churches, organisations and individuals to equip them for Christian living. This has only been possible by the generous support of many people who have pledged money month by month since 2010 to cover the rent for the premises at Glebe Street. We wish to acknowledge these individuals and their gifts, which have allowed the work of the bookshop to continue. Over recent months, however, it has become clear that, even with this generous level of support, the bookshop is no longer viable, with income from sales decreasing and costs of running the business steadily increasing. The Trustees therefore decided that the shop would close on Saturday 31st January, 2015. Copyright © 2015 Falkirk Christian Bookshop. All Rights Reserved.